At 11:00am on Monday, November 11, 1918, the guns fell silent to fulfill the agreement that had been signed earlier at Compiegne, France. The Great War, at it was called at the time, was finally over. The Allies, including the American Expeditionary Force led by General Pershing, had defeated the aggressor, Germany. It was hoped at the time that it would be “the war to end all wars”, but that hope was dashed two decades later when Germany again attacked her European neighbors. The European neighbors, joined by the Americans, fought Germany again in what became WWII. The original Great War then became known at WWI. From March 15 to 17, 1919, members of the American Expeditionary Force convened in Paris for the first American Legion caucus. 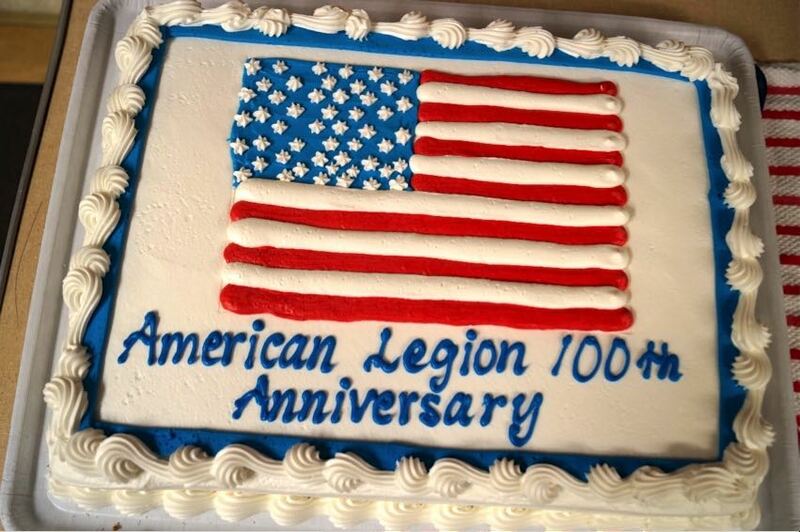 They met again from May 8 to 10, 1919, and adopted “The American Legion” as the official name of a new organization. A draft preamble and constitution were approved. Meeting on June 9, the National Executive Committee adopted the Legion emblem. On September 16, 1919, The US Congress chartered The American Legion. From November 10 to 12, 1919, the first American Legion convention was held in Minneapolis. The delegates approved the preamble and constitution. They also voted, 361 to 323, to place the national headquarters of The American Legion in Indianapolis. Indianapolis was chosen over Washington, DC. Finally, the delegates approved a resolution in support of the Boy Scouts of America, support that has continued to the present time. Today, the American Legion has over 2.4 million members in more than 14,000 posts world wide. The posts are organized into 55 departments, one each for the 50 states plus the District of Columbia, Puerto Rico, France, Mexico and the Philippines. Within each state department are geographic Areas, Districts and local Posts. The Department of Washington, with 23,599 members, contains 4 Areas, 12 Districts and 160 local Posts. Legion members belong to Posts, Post Commanders report to District Commanders, District Commanders report to Area Commanders, Area Commanders report to Department Commanders and Department Commanders report to the National Commander. Dept. of Washington Commander Roach speaking at the January 9, 2019 meeting of Post 227. 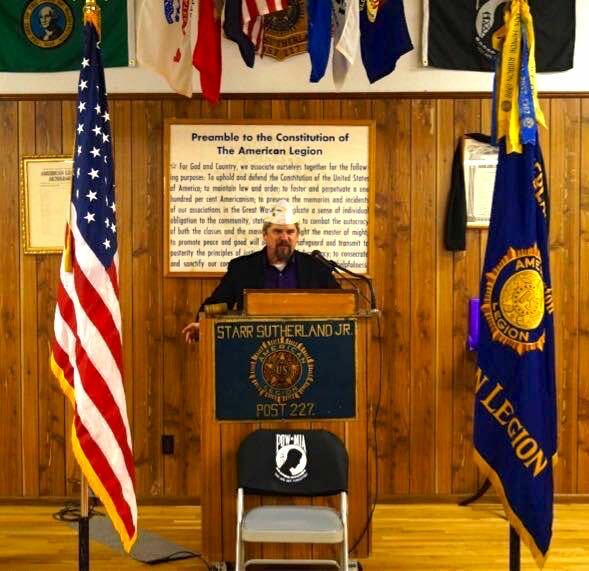 Starr Sutherland, Jr. Post 227 is The American Legion local post in Shoreline. The Post building is located at 14521 17th Avenue NE. The post was chartered March, 1948 and was named for First Lt. Starr Sutherland, Jr., who was killed in the Battle of the Bulge in WWII and is buried in Luxembourg Cemetery. Starr graduated from Lincoln High School in the Wallingford area and enrolled at the University of Washington. In 1943, with the war underway, he left the University of Washington to join the Army. Post 227, along with 12 other Posts, is in District 11 and Area 1 of the Department of Washington. Post 227 meets the first Tuesday evening of each month at the Post building. Post 227 interacts with the local communities in various ways, including sponsoring boys to attend Boys State, hosting pancake breakfasts and a summer BBQ, awarding a Life Changer Award annually to a community member who makes life better for others, and inviting all veterans and visitors to attend Post meetings, which usually feature a speaker discussing some aspect of military life or history. Most American Legion Posts have a women’s Auxiliary where wives of veterans meet and conduct programs in support of the local Post. Post 227 has a woman’s Auxiliary that was chartered about the same time, March, 1948, that Post 227 was chartered. The Post 227 Auxiliary raises funds in various ways, including distributing poppies each spring in exchange for donations and conducting rummage sales. The celebration of the 100th anniversary of the American Legion began at the 2018 national convention that was held at Minneapolis, Minnesota, the site of the first American Legion convention. Local posts, including Post 227, also celebrated the centennial. At their monthly meeting on January 8, 2019 Post 227 invited Department of Washington Commander Gary Roach to speak. Roach spoke about the American Legion and plans for celebrating the 100th Anniversary. After the Commander’s talk, those in attendance had cake and ice cream. The cake was adorned with 10 candles, one for each decade of the Legion’s existence. As the candles were blown out, the attendees sang “happy anniversary” for the Legion. The centennial year will conclude at the 2019 American Legion national convention, to be held August 23-29 at Indianapolis, Indiana, the home of the American Legion national headquarters.